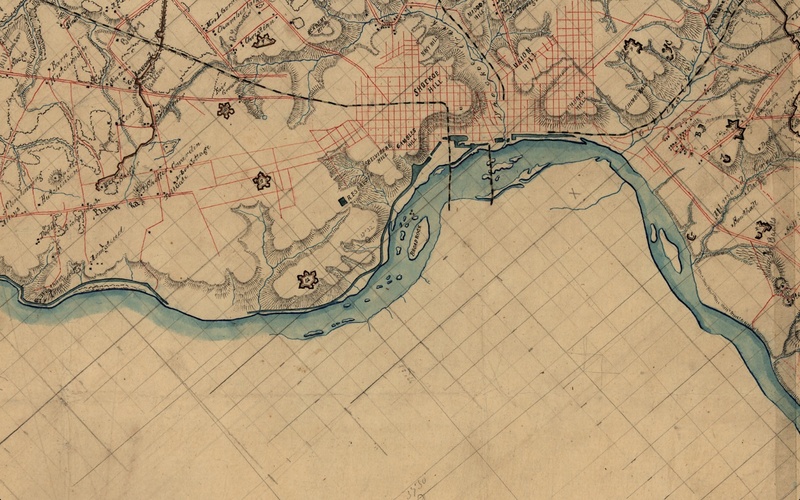 Map of Henrico, VA showing Fortifications Around Richmond North and East of the James River, detail. I gave the following two exercises to my Writing Poetry students in the last month. Because these exercises encourage students to build their poems upon concrete description, I’ve presented them together. An image is a detail that allows us to feel as if we “see” rather than understand what happened or is happening in a literary work. It’s imitative of the tangible. It suggests meaning rather than explains it. It can be within the “real world” or it can be figurative, Natalie Diaz’s men “leaning against the sides of houses” (realistic) or the coins “We are born with spinning coins in place of eyes” (figurative). In understanding how image often serves the function of both providing us with concrete details, narrative, and/or abstract ideals, thoughts, or emotions, complete the following exercise. Connotations: the pig has rabid qualities; the beard implies a kind of personification, taking on of man’s roles/behaviors; the pig is out of control; the speaker is in awe of the scene and endangers herself by looking this closely at the pig; the pig is fat because of the word “jowls”; “jowl” is used in butcher charts, so therefore this pig is meat, it’s a commodity; the pig is adorned with things outside its natural habitat and therefore this poem suggests that there’s an intersection between nature and humanity; etcetera.